Dharamshala: As the Tibetan community woke up to the sad news of the demise of Kasur Gyari Lodi Gyaltsen, compatriots and friends of Tibet from all over the world offered an overwhelming outpour of condolences and grief. Kasur Gyari Lodi Gyaltsen, a former Special Envoy for His Holiness the Dalai Lama and former member of the Kashag, who spearheaded the historic Sino-Tibetan dialogue through nine rounds of high-level talks, died last night at the age of 69. One of the tallest figures in the Tibetan political movement, Lodi Gyari had given a lifetime of service to His Holiness the Dalai Lama and the people of Tibet. The President Dr Lobsang Sangay of Central Tibetan Administration paid tribute to late Lodi Gyari in a sombre statement on his social media. “Today, we say goodbye to a true Tibetan patriot. Lodi Gyari Rinpoche dedicated his entire life serving Tibet and the Tibetan people. He was a trailblazer and leaves behind a lasting legacy of public service. We are eternally grateful for his distinguished service,” he said. Tributes and condolences poured in from prominent leaders including Democratic Leader of the U.S. House of Representatives, Nancy Pelosi. Pelosi said, in her statement, “The world has lost an extraordinary champion for the Tibetan people. Driven into exile by the Chinese government, Lodi worked relentlessly to secure a better future for Tibet. As Special Envoy and a key leader of the International Campaign for Tibet, Lodi saw the development of historic proposals for progress and built deep support for the Tibetan cause throughout America and around the world. Members of Congress on both sides of the aisle benefitted from Lodi’s insight and wisdom. 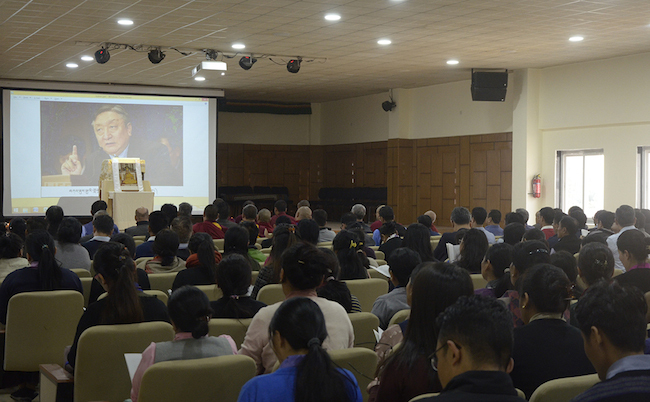 The Central Tibetan Administration held a prayer service from 02:00 to 03:00 PM today in honour of the deceased. All the offices of the various departments were shut as a mark of respect after the prayer service. Mr. Gyari was born in 1949 into an influential family in Nyarong, Eastern Tibet and recognized as a reincarnation of Khenchen Jampal Dewé Nyima from Lumorap Monastery. As a young man, deeply affected by what he had seen of the brutal occupation of Tibet, Mr. Gyari longed to take up active resistance in order to help free his fellow Tibetans. He was selected to be educated as a translator for the resistance fighters being trained in the United States. However fate and circumstances intervened, and instead, he became a journalist, first as the editor of Tibetan Freedom (a newspaper in Tibetan) and then of the Voice of Tibet (which subsequently became Tibetan Review), the first-ever English language publication by a Tibetan. Mr. Gyari continued to believe in the need for armed resistance in Tibet but also saw the need for a strong grassroots political movement among the younger generation of Tibetans. To pursue this, in 1970 Mr. Gyari, together with three close associates, established the Tibetan Youth Congress with the goal of motivating the younger generation of the Tibetan community to unify and pursue the political struggle for Tibet’s future. Mr. Gyari rose through the ranks of the Tibetan leadership, first as the Speaker of the Parliament and then later as a member of the Kashag (Cabinet). Mr. Gyari was one of the most dedicated and articulate proponents of the Dalai Lama’s Middle Way approach, which he called the most farsighted and brilliant strategy for the Tibetan people. While in his role as Special Envoy to His Holiness the Dalai Lama, Mr. Gyari also served as President of the International Campaign for Tibet in Washington DC from 1991 to 1999. Following his term as President of the International Campaign for Tibet, Mr. Gyari joined the organization’s Board of Directors as Executive Chairman, a position he held till 2014. Mr. Gyari advocated for key legislation in the US Congress benefiting the Tibetan people. From 1991 to 2011, more than $185 million in funding was set aside by Congress specifically for the Tibetans in Tibet and in exile. His efforts have contributed directly to the institutionalization of US support for Tibet in the form of the Tibet Policy Act (2002), comprehensive legislation that details policy and material support to the Tibetan people and His Holiness the Dalai Lama for a negotiated solution to the Tibetan problem. In the 1980s and 1990s, Mr. Gyari also served as the head of the Tibet-United Nations initiative. He and his team successfully reintroduced the Tibet issue into the UN system when the UN Sub-Commission on Prevention of Discrimination and Protection of Minorities passed the first (since 1965) UN resolution on Tibet in August 1991, ending 25 years of silence on the situation in Tibet. Mr. Gyari’s life-long diplomatic experience, his firm belief in the Dalai Lama’s Middle Way approach and his passionate desire to help his fellow Tibetans led to the most important mission of his life, when His Holiness formally entrusted him with the task of leading negotiations with the government of the People’s Republic of China. Mr. Gyari had first visited China in 1982 and again in 1984 as one of the three members of a high-level delegation for exploratory talks. Beginning in 2002, he led the Tibetan team that conducted negotiations with the Chinese government for nine separate rounds of talks. Mr. Gyari decided to resign as Special Envoy in 2011. He remained in this position for another year as he hoped to maintain the fragile relationship with the government of the People’s Republic of China, which he had worked hard to establish and sustain during his tenure. However, due to the utter lack of progress in the talks and the increased repression inside Tibet, he resigned in May 2012. However, Mr. Gyari continued to serve as a member of the Tibetan Task Force on Dialogue with China. Mr. Gyari was the Chairman of the Board of the Conservancy for Tibetan Art and Culture, a US-based nonprofit organization that works to preserve Tibet’s living cultural heritage in Tibetan cultural areas and communities around the world, working with leading institutions, scholars and religious leaders. Mr. Gyari did not limit his activities to Tibet issues. His international activities also included active engagement in peacemaking and conflict resolution through Kreddha, the International Peace Council for States, Peoples and Minorities, which he co-founded with the late Don Rodrigo Carazo, former President of Costa Rica, and others. Through his involvement with the Sanithirakoses-Nagapateepa Foundation and as a founding member of the International Network of Engaged Buddhists, based in Bangkok, Mr. Gyari engaged in the promotion of responsible environmental stewardship and development and social justice in different parts of the world. Mr. Gyari was also a co-founder with Michele Bohana, Joel McCleary and Lavinia Currier of the Institute for Asian Democracy (IAD), which became one of the first, most enduring and effective organizations working for human rights and democratic reform in Burma. He contributed to numerous publications and spoke at the Council on Foreign Relations, The Kennedy School of Government, The Brookings Institution, Center for Strategic and International Studies, Asia Society, Asia Centre in Paris, The Institute of South Asian Studies in Singapore, India International Center, The Heritage Foundation, The Foreign Correspondents’ Club of Japan, Chatham House, Australian National University and others. Mr. Gyari travelled extensively and visited more than 50 countries. He was invited numerous times to testify before the US Congress, European Parliament and other government bodies and institutions on the Tibet issue and the threats confronting Tibet’s cultural and spiritual heritage. Following his retirement in 2014, Mr. Gyari became a research scholar in the Asian Studies program at Georgetown University and a nonresident senior fellow in the Foreign Policy program at the Brookings Institution. Mr. Gyari devoted his time until his passing in writing his memoir, which he felt would be his additional contribution to His Holiness the Dalai Lama and the Tibetan cause. The memoir is in its final stages of completion.